Ron Kinnear and Africa Missions team members Herman Hinsbeeck and Robert Owade with Rwanda pastors preparing to spread the Gospel. Over 100,00 New Church Nurtured Christians in 7 Years! March 2015—The report is just in that we have toppled over the 100,000 count in 7 years! We are so thrilled with what God is doing through people willing to spread the Gospel! By December 2016, we are believing for this count to rise to 150,000 new Christians. It is so thrilling to know that we have empowered people to spread the Gospel and are reaching out to win others! This has come to pass through 4-day Evangelistic Training Clinics followed up about 6 months later with a Celebration, where the trainers return to report the people they have won to the Lord. Ron says that it cost more than starting a Bible College, but is very effective in winning people to Jesus. Jan 2014—We praise God for His faithfulness!!! Seven years ago, God nudged me to publicly stretch my evangelism goals to help reach the 2 billion people who have never heard of Jesus. He propelled me far beyond my own thoughts and dreams to win 20,000 brand new converts in 3 years. Fervent prayer to get His wisdom for this to be accomplished lead me to use the Evangelism Explosion program deep in the heart of Central-East Africa—in Burundi, Rwanda, DRC (East), Tanzania and Uganda. These new converts must have been presented the Gospel one-on-one, personally trained, discipled, and church nurtured to be in Africa Mission’s count. The result of our first 3 year goal of 20,000 was exceeded by an amazing number of 26,000! And now in our sixth year of this program, with wonderful trainers Herman Hinsbeeck and several others whom we hand trained and have gained much experience as they implemented EE3 in their own local churches, we had to keep lifting our goals higher—our 50,000 former goal was lifted to 80,000 which was exceeded by the actual number of 83,562 new converts for Christ in the last 6 years!!! Praise the Lord!!! New brothers and sisters with whom we will spend eternity! August 2013—In 2007 I was boldly challenged to step up my evangelism efforts to help reach the 2 billion people who have never heard of Jesus. I was greatly touched by the great need and committed to winning 20,000 people to Christ in the next 3 years. I've made big commitments, but this was the biggest one at the time. I had to seek the Lord as to the how it could happen. He lead me to use the network of people who have been trained and/or assisted by Africa Missions to win others through personal evangelism, using the program, Evangelism Explosion. This explosion is taking place in the heart of Africa—Uganda, Rwanda, Burundi, the Democratic Republic of the Congo, and Tanzania is now added to the list!! The results of this campaign have been amazing and thrilling! We met and exceeded that first goal! Now we are in the middle of our 6th year of this miracle. Our goal for the 6th year was 50,000, but we went over and above that goal last year with 60,000 people making commitments to Jesus. So we made the new goal of a total of 80,000 by the end of this year! We are close, very close to realizing this dream as well. New numbers were received today from our newest field in Tanzania! 1320 decisions for Christ! These figures came in from the area where we were the first white people to set foot into their territory! PTL! The official figure now stands at 78,795 as of August 2013! We only need to reach 1205 souls to make our revised goal of 80,000 first-time decisions for Christ by the end of 2013! Praise be to Him! Uganda, Rwanda and Burundi have submitted their figures, but the number will still grow even higher once the Democratic Republic of the Congo send in their report. Our long range goal through 2019 is 500,000 new Christians! The number of pastors and church leaders empowered to grow their churches with Evangelism Training now stands at 1,596! To reach the 2 billion souls that have never heard about Jesus, all believers will have to do more than we are presently doing to reach the lost. When we realized the great number of people who still have not heard of Jesus and His saving power, we realized we must do something extra to fulfull our Lord's commision. Goal Of 50,000 First Time Decisions For Christ Surpassed! August 2012—Our initial goal was to win 20,000 souls for the Lord within three years. We actually reached 26,000 souls with in that period. We set our sights higher. Our next dream was to grow this figure to 50,000 souls by the end of 2013. During our visit to Central-East Africa in May and June earlier this year we received reports from Burundi, Rwanda and Uganda. When we totaled the figures we had crossed the threshold of 60,000 first-time decisions to accept the Lord Jesus as their Saviour! With another 18 months to go our sights are raised to 80,000. Hallelujah! Our appreciation goes to all the pastors who are participating in this project. 1200 pastors and church leaders were trained in Evangelism Explosion. They in turn had to train others who would in turn train others…… Those who committed themselves to this program saw phenominal growth in their churches and many new churches were planted. The Lord is doing exceeding more than we think ask or think! December 2011—40,000 people saved in 4 years! We are thrilled to announce that 40,000 people have given their lives to Jesus through this ministry over the last 4 years! Praise the Lord! At first we stretched our faith to believe for 20,000 souls for the Lord in 3 years (2007-2010), which the Lord far exceeded with a harvest of 26,000 precious souls for His Kingdom! By 2021 we are trusting the Lord to win 500,000 souls. We need sponsors for the clinics that will be conducted in January through to March next year. Can you help us? December 2010—We declared 2010 our “Year of Celebration.” To date we trained 1054 pastors and church leaders in Uganda, Rwanda and Burundi in personal evangelism. Pastors have submitted progress reports during our celebrations on how many souls were birthed into the Kingdom. The official figure now stands at 20,929! The Burundi coordinator has sent out a research team to find out how many souls have been won in that country during the past 6 months. Also, our Land Rover let us down, and consequently, we will only be able to visit Uganda next year to conduct celebrations. This will greatly increase this figure. During our recent visit three Evangelism Explosion (EE3) clinics were presented. 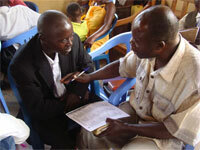 We praise the Lord that a new country was included for a clinic, the Democratic Rep. of the Congo (DRC). Previous attempts were frustrated due to war and unrest. The enemy again wanted to frustrate our plans. When we arrived at the border between Rwanda and the DRC, we were expected to pay $250 each for a visa. All the pastors of the DRC instead crossed the border and came to where we were! 53 pastors and church leaders attended the clinic. They were greatly motivated and left greatly enthused to win souls for the Lord. One of the Bishops is trusting the Lord for a harvest of 4000 souls before the end of December. We plan to be back to conduct another EE3 clinic in Goma, have a celebration for the souls won and have a conference with several churches participating in May 2011. Will you do “something extra” and help us with this project? Or would you like to help us build a church building or assist with a Bible college student? We would love to hear from you. God bless you as we join together to spread the Gospel and change the world! (Contact us) Pray with us for a great harvest of souls! The effects of the "SOMETHING EXTRA" Project are tremendous. When our team was in Uganda, they saw the effects of Evangelism Explosion training even in the remotest villages. A great harvest is coming in! December 2009: IBANDA—The team moved to Ibanda which is situated to the West of Uganda where an Evangelism Explosion clinic was conducted for pastors. Initially we arranged the clinic for 50 pastors but 84 showed up! This training is part of our “Something Extra” programme. In three years time (2007 – 2009) we were trusting the Lord for 20,000 first time decisions for Christ. In total 814 pastors and church leaders were trained and thousands of souls have been birthed into the Kingdom. Exponentially, if the growth continues for the next 8 years 500,000 could be won for the Kingdom of God.